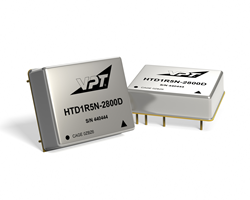 VPT, Inc. (VPT®), a HEICO company (NYSE:HEI.A) (NYSE:HEI), released the HTD Series of DC-DC converters at the iMAPS International Conference on High Temperature Electronics, HiTEC 2016. The HTD Series of DC-DC converters, leveraging VPT’s high reliability power supply design heritage, is specifically designed for harsh and extreme temperature environments including downhole oil and gas, MWD/LWD and wireline logging tools, aircraft engine electronics and other industrial applications requiring reliable operation in high temperatures. The HTD isolated 1.5 Watt DC-DC converter operates from -55°C to 155°C and the HTD non-isolated DC-DC converters operate from -55°C to 185°C. Each model has dual outputs and is designed using thick film hybrid microcircuit technology, bare semiconductor die integrated with passive components and thick film conductors on a ceramic substrate. Within the HTD design, component-attach and die bonding are optimized for high temperature life, and hermetic metal packaging protects internal components for long-term reliability. The HTD Series of DC-DC converters are available for immediate sale. Unit pricing begins at $700-800 (USD) for volume quantities, depending on product model. Custom versions are also available. Additional information on the HTD Series and specific product datasheets can be found at http://www.vptpower.com. VPT, Inc., part of the HEICO Electronic Technologies Group, leads the industry in providing innovative DC-DC power converters, EMI filters, and custom engineering services for avionics, military, and space applications. Every day, global organizations like NASA, Lockheed Martin, Boeing, BAE Systems, the United States Air Force and many more depend on quality solutions from VPT to power critical systems. On the ground, in the air, or beyond, VPT provides the power conversion solutions driving critical missions that require high reliability. For more information about VPT, please visit http://www.vptpower.com. HEICO Corporation (NYSE:HEI.A) (NYSE:HEI) is engaged primarily in niche segments of the aviation, defense, space and electronics industries through its Hollywood, FL-based HEICO Aerospace Holdings Corp. subsidiary and its Miami, FL-based HEICO Electronic Technologies Corp. subsidiary. For more information about HEICO, please visit http://www.heico.com.